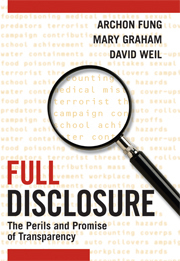 As the Obama administration calls for more transparency in government, NextGov interviews Archon Fung, author of Full Disclosure about what government (and non-government) transparency really means. Nextgov: How do you define transparency? Fung: My definition is quite a bit different from the conventional wisdom about transparency. A transparency system is designed to allow people to improve the quality of decisions they make in some way, shape or form, and it enables them to improve their decisions to reduce the risks they face or to protect their interests. Some of those decisions are about political accountability but some are in private life, like what food to buy or what doctor to go to. So much of the talk from the administration and from outside the administration in the nonprofit world and advocacy groups is about governmental transparency — that is making the activities of government more transparent. There are two cautionary notes here. Government should be transparent. It’s absolutely fundamental. But I am a little bit worried about the way transparency is being talked about and transparency policies and platforms are being executed now. One aspect is the discourse of governmental transparency is primarily about accountability. You look at transparency of the stimulus. It’s about contracts and following the money, and making sure the bids are let properly and there is no corruption, and the money is being spent efficiently. That’s transparency for the sake of accountability, which is all great. Except for — and I don’t want to over-criticize your profession — when you marry the transparency systems that are geared toward governmental accountability, one of the major consumers of that transparency is going to be journalists. Part of the culture of political journalism is a critical culture. You guys have a good story when you find somebody doing something wrong in government. Then there is the public political culture that is fairly cynical about government and its possibilities. You look at public opinion surveys, and one question they ask people, “Do you think that government is being run by a few big interests or for the benefit of all?” And 70 percent of people answer by a few big interests. So people are pretty cynical out there. The effect of governmental transparency that is about accountability may be simply to make that problem worse, to further de-legitimize government, because what the transparency system is doing is helping people catch government making mistakes. That’s good. You do want to catch government making mistakes. But you want transparency and information systems that also highlight when government is doing a good job. Much of the current activity around governmental transparency is like creating a big Amazon rating system for government that only allows one- or two-star ratings. But that’s not necessarily the case. You could also construct governmental transparency systems that provide the full five-star range. Nextgov: You view transparency more broadly, then. Fung: Yes. Most of the people working and thinking about transparency are thinking about transparency of government. There’s an underlying presumption there that is a little bit of a mistake. The underlying presumption is that of all the organizations in society, government is the one that creates the most risks and most threats to citizens’ well-being and interests. Part of that is right. Government does do a lot of things that create risks for people and harm them, so it is important for government organizations to be transparent so people can try to know what the risks are and try to do things that control and minimize the risk. But there are private sector organizations out there that make your food or cars or provide social services or health care that also create huge risks, and upon whom individuals depend on enormously for their well-being. I think the same rational for governmental transparency applies even more to making these activities and actions for all these other organizations more transparent.